Sterling Overseas was established in 1993. Initially, we dealt in the distribution of Bathroom Accessories, Sanitaryware, Tiles and Plumbing. 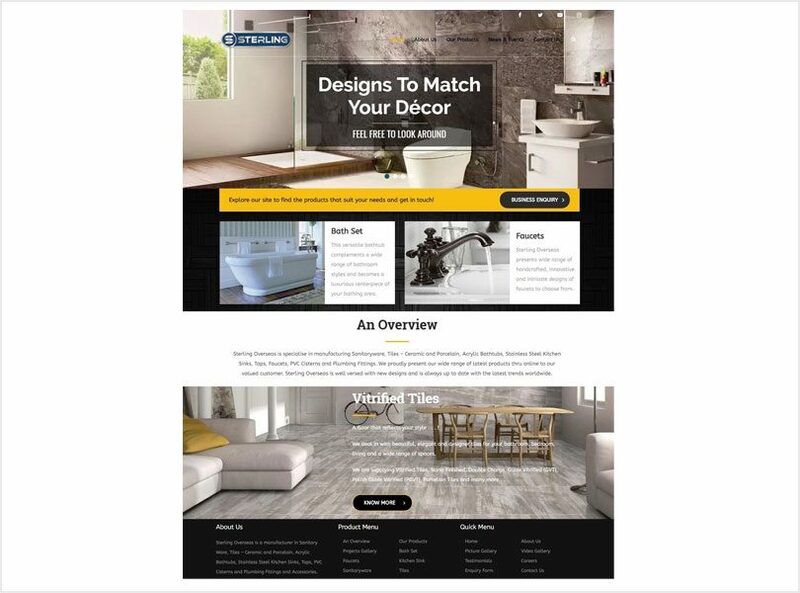 We currently specialise in manufacturing our own Sterling brand of Sanitaryware, Tiles – Ceramic and Porcelain, Acrylic Bathtubs, Stainless Steel Kitchen Sinks, Taps, PVC Cisterns and Plumbing Fittings. Our list of products is expanding rapidly as Sterling is a growing manufacturer that strives to provide our valued customers as per their specific requirements. Besides distribution all over India, Sterling has offices and representatives in Europe, Africa, UAE, Middle East, America, Australia, and China. However, our largest clientele is in Africa, Europe and The Middle East. Our large production scale in India and China allows us the privilege to supply more than 300 containers worldwide per month. Our business is based on Good Quality Products, Excellent After Sales Service, Friendly Customer Service and Competitive Prices.